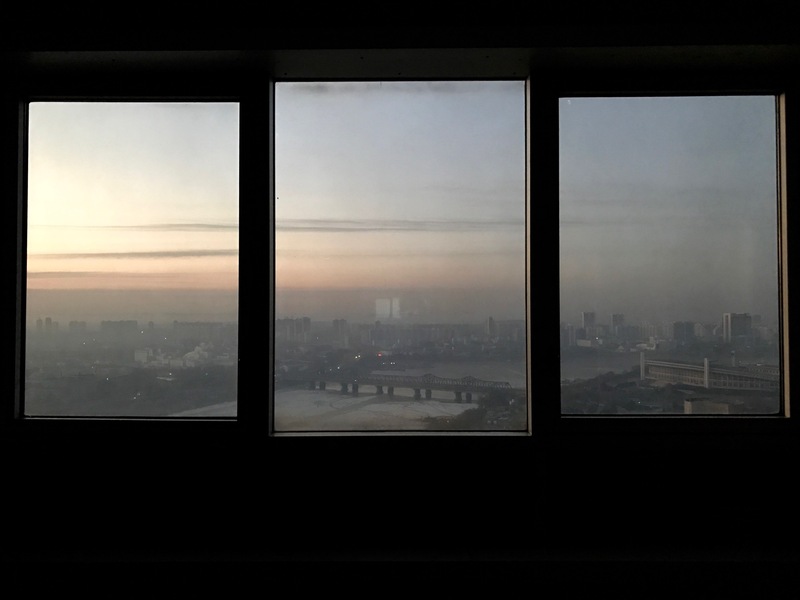 As international sanctions continue to provoke, and unsuccessfully disrupt, nuclear development in North Korea, Pyongyang’s hotels offer a window into a veiled economic history and built environment otherwise elided by western media. A cargo vessel bearing the Cambodian flag, the Jie Shun, floats inactive in the El-Adabiya port south-west of the Suez Canal. On the 28th of August 2016, Washington calculates its coordinates and informs Cairo of the tarp-shrouded bulk freighter’s location. Upon arrival a year later on the 1st of October 2017, Egyptian customs agents inspect the vessel and discover roughly 30,000 soviet-style rocket propelled grenades concealed beneath containers of iron ore. The Jie Shun sailed not from Cambodia, but from North Korea. This discrete maneuver illustrates the type of rogue tactics the DPRK uses to ensure meager economic survival amidst, thus far, eight rounds of unanimously imposed U.N. sanctions since the nation’s first nuclear test in 2006. Since then, sanctions have expanded to include the trade of arms and military equipment, iron, seafood, mineral, coal, luxury goods, caps on oil imports and North Korean labor exports, along with asset freezes for those involved in the DPRK’s nuclear program. In such an aggressively sanctioned economy — the effects of which make life more unbearable for the North Korean population rather than halting their government’s nuclear programs — the U.S. State Department Bureau of Consular Affairs urges tourists to “consider what they might be supporting.” The Bureau even speculates that tourist revenue may be channeled to fund nuclear development. This, with the Treasury block, would seem to suggest that by engaging the DPRK’S small accommodation and service industries, a tourist’s monetary trail could constitute a series of “enabling” transactions between the individual and the state. Their movement, access, and expenditure are thus politically bound to risk. Western tourism to North Korea allegedly ranges from four to five thousand visitors annually; and while the U.S. State Department does not record the number of Americans who visit, Koryo Tours, a, Beijing-based travel agency offering trips to the DPRK, estimates that an average 20% of its clients travel from the U.S. (when political tensions have eased enough to permit American passports). Founded in 1993 — the same year the International Atomic Energy Agency accused North Korea of violating the Non-proliferation Treaty — Koryo Tours, with their claims of providing “Access,” “Experience,” “Innovation,” “Knowledge,” “Commitment,” and “Projects,” promises to “allow you to go further and see more than you ever imagined” in “one of the least understood” countries. 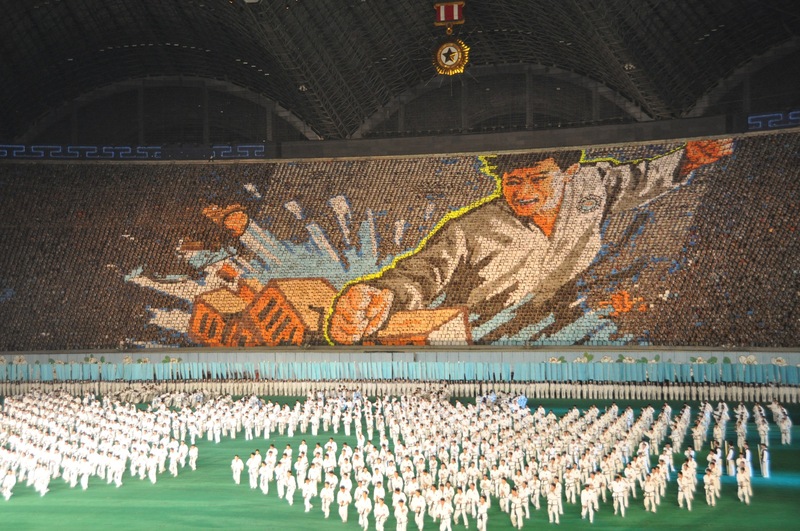 Itineraries are planned in advance to correspond with national holidays and events, like weekend trips from Beijing to participate in the Pyongyang Marathon, Kim Il Sung’s birthday, or an eleven-day “Unseen Korea” tour. Coordinating visits to Russia, Turkmenistan, Mongolia, and Tajikistan as well, Koryo Tours unifies a small constellation of former Soviet blocs and satellite states under the auspices of a now-familiar ideology of responsibly-facilitated tourism, a product of globalization formed in the context of the “steadily expanding international order inaugurated by the end of the cold war,” as articulated in a letter Barack Obama left for then-incoming president-elect Donald Trump. View of the Yanggakdo International Hotel in Pyongyang. Many comments across the spectrum of TripAdvisor’s ratings — the site’s metrics deduce 10% “excellent,” 44% “very good,” 42% “average,” 3% “poor,” and 1% “terrible”— focus positively on the revolving restaurant offering panoramic views of the greater Pyongyang urban area. Others praised features include a spa, a sauna and pool, gift shops, bars, a bowling alley in the basement, billiards, a karaoke lounge, and a casino accessible exclusively to foreign travelers. That Al-Jazeera and BBC networks are available on the in-room TVs delights, even shocks, many; that the notoriously “secret” fifth floor is inaccessible by elevators flirts with a sense of dystopic allure. View from inside the Yanggakdo International Hotel. Marooned at forty-seven stories along the Taedong shores, Yanggakdo’s experience seems, then, to lie it in its isolated verticality. It gives the impression of having “everything under one roof,” effectively operating as a “cash cow for the state.” However, commodified taste comes at a price and is confined to a cyclical crisis of equal parts itinerant boredom and errant curiosity. In Yanggakdo, Easterling’s active touristic solvent is realized as a monetized experience for guests. 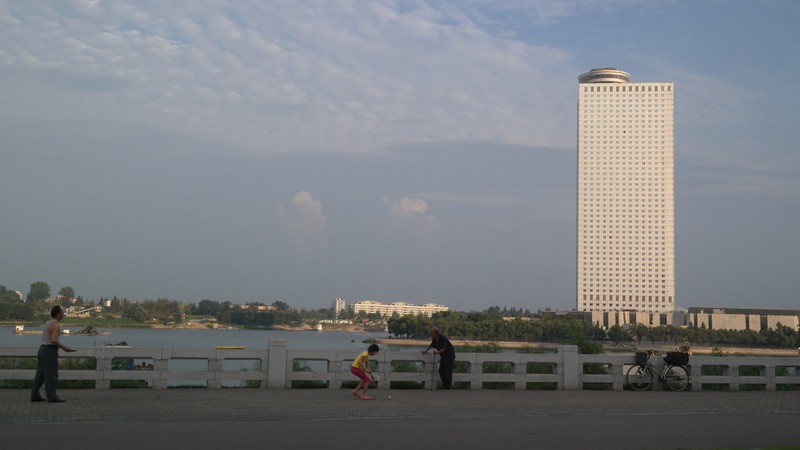 The money circulating within comes from without; an ironic display of excess-in-wait for the “frugal traveler in search of an adventure.” It is, after all, “the tour hotel for international visitors.” As Easterling’s formula further suggests, tourists’ views of Pyongyang’s landscape from the revolving restaurant are views many North Koreans themselves aren’t afforded — “As a western tourist you always get the best rooms!” Pursuing service economy standards of a frictionless experience, Yanggakdo augments a guest’s acquired privacy to both literal and figurative heights. An aerial view of Pyongyang, with the Ryugyong Hotel rising in the background. There is in fact a ninth hotel, which is comparable to Yanggakdo in its architectural expression of the DPRK’s precarious economic conditions. The Ryugyong Hotel, however, offers a less transparent window into the Regime’s ability to operate under exhaustive sanctions. Construction on this 105-story pyramid—etymologically rooted in a historical name for Pyongyang, capital of willows, and originally estimated to attract $230 million in foreign investments—began in 1987 as the DPRK undertook massive infrastructural projects to host the 1989 World Festival of Youth and Students, the largest international gathering slated to take place in the country. Logistical hyperbole in turn characterized Pyongyang’s preparation: Ryugyong was to be the world’s tallest hotel, built with intentions to subordinate to second place Swissôtel’s The Stamford (called the Westin Stamford at the time and completed in 1986) in Singapore. At the same time, the Rungrado 1st of May Stadium was constructed, which immediately became, and remains, the world’s largest sports stadium, with a 150,000 seating capacity. A mass game taking place inside the Rungrado 1st of May Stadium. Considering that Moscow hosted the previous festival in 1985, Pyongyang’s forthcoming symbiosis of political and infrastructural consolidation as the thirteenth host to a prospective 22,000 attendees from 170 countries doubled as a timely communiqué to the world vis-à-vis the 1988 summer Olympic games in Seoul, South Korea. “For Anti-Imperialist Solidarity, Peace and Friendship” read the ’89 gathering’s motto, variations on the same anti-bellicose vocabulary used for festivals held in Havana, East Berlin, Sofia, Prague, Budapest, Pretoria, Algiers, Helsinki, and Vienna. 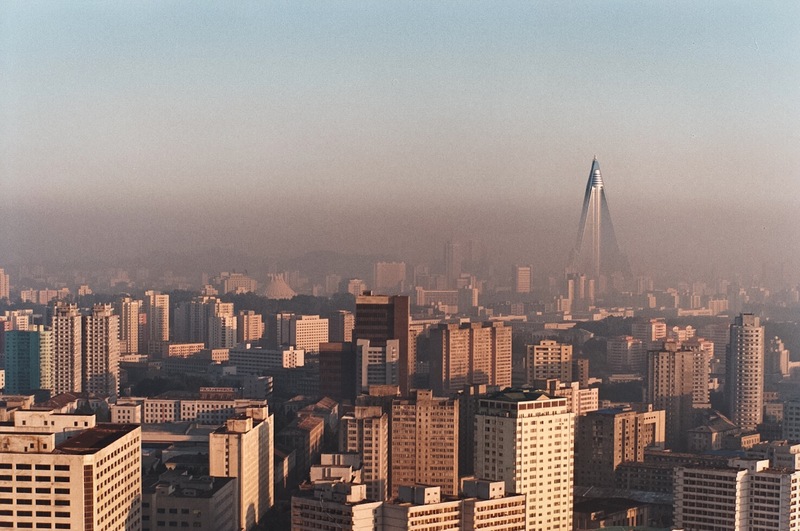 In 1992, construction on Ryugyong paused due to an economic crisis compounded in part by the 1991 collapse of the Soviet Union, paving way for the North Korean famine, and ossifying a grim turn of the century decade for the country. It stands abandoned to this day as the world’s twenty-eighth-tallest building. To suggest that its quarter-of-a-century presence in the rapidly expanding Pyongyang skyline merits the international mockery it has received—fatalistically nicknamed the “hotel of doom” by Western journalists, labeled an architectural sin, and deemed the biggest mystery in Pyongyang—would consign Ryugyong to the realm of compulsive political affect ranging from imaginative resentment to the very policies governing U.S.-North Korean relations since American involvement in the Korean War. 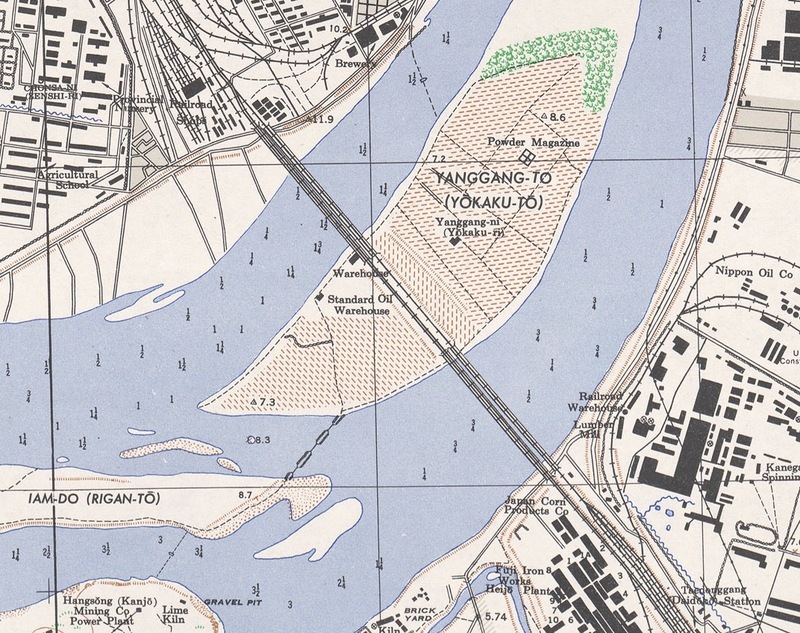 Detail of Yanggak Island from a 1946 map of Pyongyang created by the U.S. Army Map Service. Egyptian global engineering and construction contractor Orascom invested in Ryugyong in 2008 in exchange for a 75% stake in Koryolink, North Korea’s first and only 3G network. By 2011, the reflective glass exterior was completed. Following the political dimensions of touristic fantasies, an Esquire article published the same year opines about a sanctified belligerence towards the hotel: “the worst building in the history of mankind…even by communist standards, the 3,000-room hotel is hideously ugly…like some twisted North Korean version of Cinderella’s castle.” Such desperate descriptions act as a palliative for a deficit of knowledge about North Korea, a process dialectically in lockstep with glorified American inter- and post-war mobilization. Economic production based on planned urban obsolescence, disinvestment, and privatization, for example, “underwrote Cold War American practices and values from economics to geopolitics.” Pyongyang’s postwar Juche ideology, on the other hand, intended to distinguish itself from Soviet Union Marxist-Leninism, and equally important, abolish Japan’s asymmetrical colonial occupation by taking control of industrial development, iron works, mines, and fisheries. 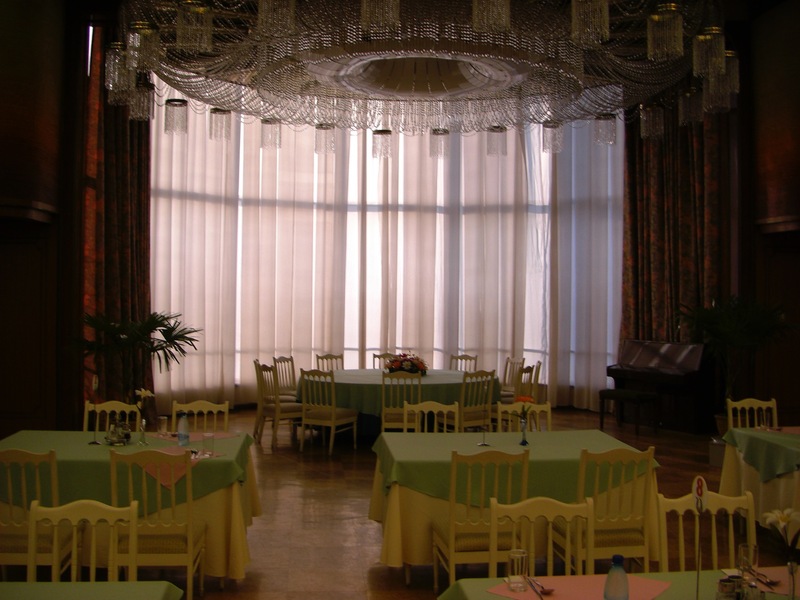 A dining room inside the Koryo International Hotel. In 1953, a post-war master plan for an internationally standardized city, including the expansion of facilities for foreign visitors, was designed in the wake of the U.S.’s destruction of the northern peninsula. A devastated Pyongyang had an opportunity to programmatically redesign the city in a way that most other socialist cities did not experience. This approach was heralded as a model for other cities in terms of symbolic and spatial design. During the first three-year construction plan (1954-56), Pyongyang received assistance from both Bulgaria and Hungary. To this end, the ’60s through ’70s marked epochs of relative stability and growth for the DPRK’s capital. High-rise housing developments appeared along major boulevards with a mixed typology of high to mid-rise buildings. In microdistricts inspired by Moscow’s 1935 plan, green zones were spatially balanced with residential, urban, and industrial zones, referencing Ebenezer Howard’s garden city designs. Monuments to a developing political project were erected, and major public squares nodally connected parts of the city. At 170 meters tall, the Juche Tower, constructed in 1982, stands just one meter taller than the Washington Monument; Kim Il Sung’s statue, a mere 22.5 meters, 116.5 meter shorter than the Statue of Liberty. Ryugyong, 330 meters, stands in a residential square just north of the city’s center surrounded by the Potong River. After Orascom’s intervention, Kempinski headed Ryugyong’s project management. As the self-described “oldest European luxury hotel group” whose “prestigious heritage” forecasts a “bright future” for clients in Croatia, Austria, Myanmar, Jordan, UAE, China, Qatar, Oman, Cuba, Ghana, and Egypt, Kempinski’s mission to “satisfy the expectations of the stylish and discerning traveler” by “bringing a story to life” also came to a halt in 2013 amidst rhetoric of a thermonuclear war issued against South Korea from the North. A perspective view of the Ryugyong Hotel. 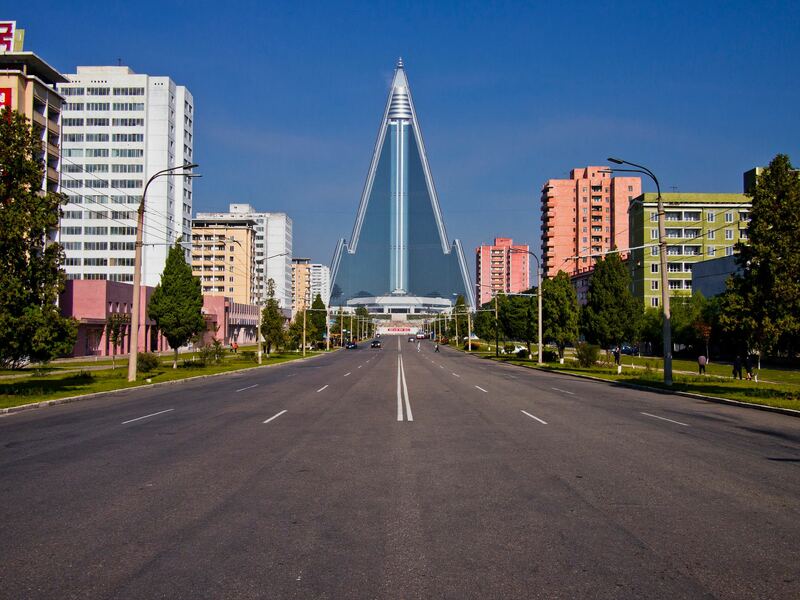 Ryugyong captures one’s gaze, as it was ostensibly intended to, whether from Yanggakdo’s revolving restaurant or on Google images; whether from Pyongyang proper or halfway around the planet. Its production was a response to an unprecedented occasion; its ongoing stasis as a stock image is an unintended consequence of a restructured global order. “The mutual attraction between tourism and the DPRK exposes political dispositions in both worlds… the capitalist must also choose opportune moments to declare the DPRK evil and itself pure,” continues Easterling. Rygugyong’s exorbitant vacancy is no exception to this seduction. America’s belligerent stance toward North Korea, characterizing it as part of an ‘axis of evil,’ galvanizes the DPRK’s most violent military programs, and places the two countries back in Cold War architecture of symmetrical mimicry, fragility, and innocence. This, together with the neoliberal belief in a slow inculcation of capital’s superior logics, constitutes a military-market containment of sorts. As a skyscraper, it aspires to the standardized global model of development “more familiar to the world than the context of its host country.” As an unfinished project, it bewilders the fragile and finite capitalist life cycle of advantageous investment opportunities; and as the glass exterior reflects gazes from near and far, it innocently defies the American logic of sanctions and imperial dominance as the inevitable consequences of time-tested coercive policies. Stubbornness is perhaps a more realistic expression for Ryugyong, which, like U.S.–North Korean relations, exemplifies nuclear deterrence—a long-term balancing act suspending its target audiences in short-term disbelief. And for the Yanggakdo, “be thankful for the views from the room over the river towards the pyramid-shaped hotel…it’s supposed to open soon, but I hear it’s tilting.” The hubris of unrestricted height serves the speculative imagination on both sides of the enduring iron curtain, after all. Jake Valente is an independent editor, writer, and researcher who focuses on American imperialism and its global infrastructure’s relationship with human (un)settlement. He works with a variety of academic publishers and journals, including MIT Press, and studies in MIT’s Department of Urban Studies and Planning.